Like many people who love the mountains, I get a bit giddy when it snows. 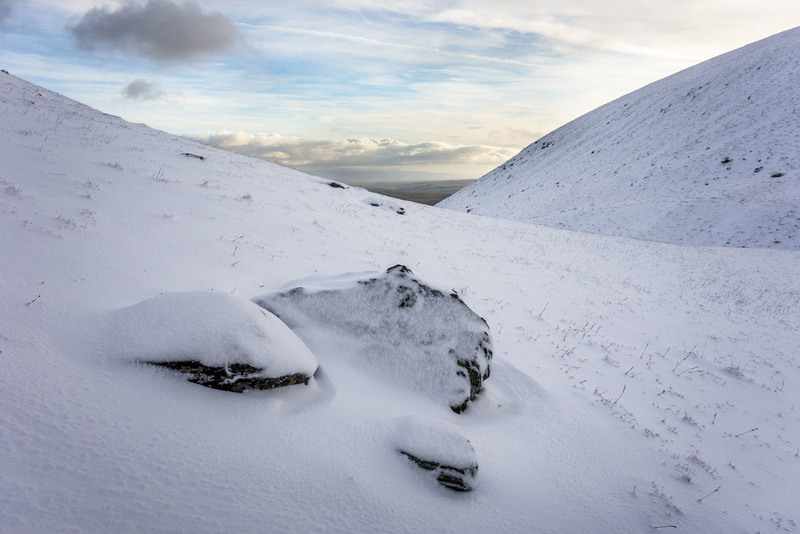 I'd been considering a winter wild camping mission for a while. 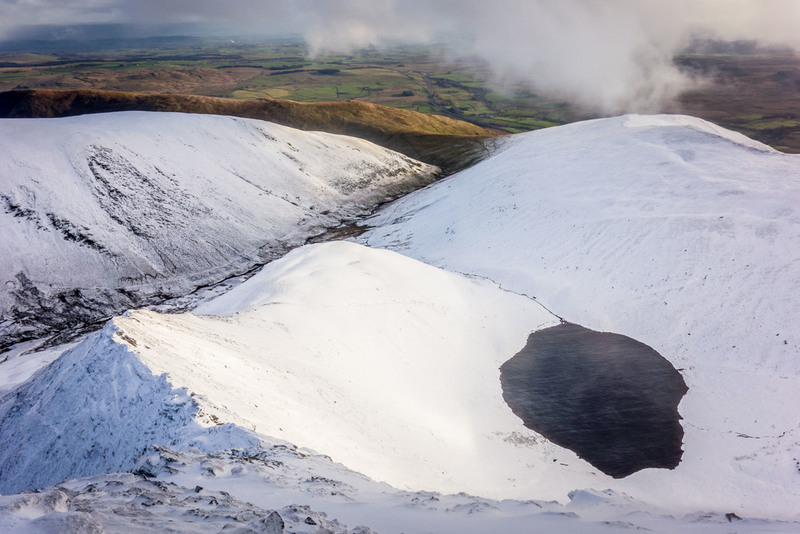 After a decent fall locally here in West Yorkshire I checked out the ground conditions and weather reports on MWIS and www.lakedistrictweatherline.co.uk - it looked like Blencathra had a good covering of snow higher up and there was a brief window where the weather looked reasonable. I got all my gear together and set off. I began to question my sanity when I arrived at the car park in Scales and put my boots on ready to set off into the dark and rain on my own at around 11pm. Not the most inspiring image to begin with: heading up by torch-light. 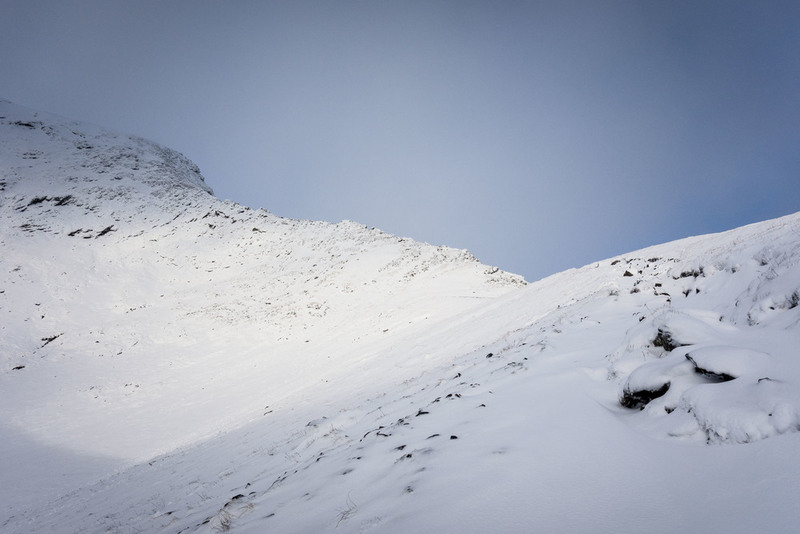 The plan was to go up from Scales and camp by Scales Tarn, then go up Sharp Edge the next morning to the top of Blencathra, and descend via Hall's Fell Ridge. This was my first time wild camping solo in the snow/mountains. I have a few new-ish (to me) bits of gear I hadn't tested much yet and this seemed like a good opportunity to review them: a Glacier 1000 sleeping bag and a Changabang jacket from Mountain Equipment, an MSR Hubba NX tent, and an Alpkit Numo sleeping mat. Most of these had seen some use already but not in these potentially challenging conditions. I was also testing out a Sony RX100 mk I compact camera. I'm still trying to work out whether this can be a genuine DSLR replacement for mountain photography, more on that later (the main bit of camera geek talk is at the end so you can skip that bit if you're not interested!). The first glimpses of snow appeared as I got to around 600m altitude - as I approached Scales Tarn the rain turned to sleet and then snow, with a thick covering over the path. The falls on the last steep ramp up to the tarn looked stunning in the brief spells of moonlight that appeared periodically. Finding a sheltered flat spot to camp in was a challenge, I eventually settled on the tiny 'beach' by the tarn. The wind had picked up quite considerably and the ground was mostly unstable/hard so getting the tent up took a while. Eventually though I was warm and cosy in my porch with super noodles and a nice Bruichladdich to keep me company. It was a pretty wild night with some very strong gusts of wind - at one point I had to get out and redo one of the pegs but the tent held firm and I managed a few hours of reasonable sleep. One of the main things I really like about the Hubba NX is that the porch is really roomy for one person. Easily room for boots, bag, ice axe etc and still plenty of space to cook in. I'm a big fan of the GSI Pinnacle Soloist cookset I've had for a while too - perfect for one and really compact and lightweight with an MSR Pocket Rocket and canister inside. The Alpkit Numo is a great lightweight, cheap and comfy sleeping mat - however it isn't designed as a 4 season mat, and you could feel a little cold coming up from the ground, even with the super-warm ME down sleeping bag. I was still perfectly warm enough though, perhaps not surprising given that the Glacier 1000 has a comfort limit of -16°C. 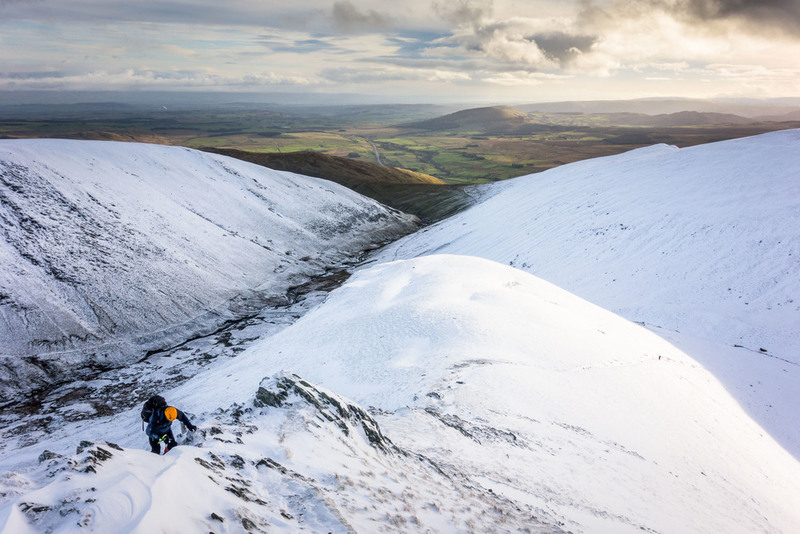 I woke up the next morning to a slightly dull sunrise, and after packing away my gear set off up Sharp Edge. The mountain looked stunning as the sun started to make it's way across the tarn and light up the crags and gullies. 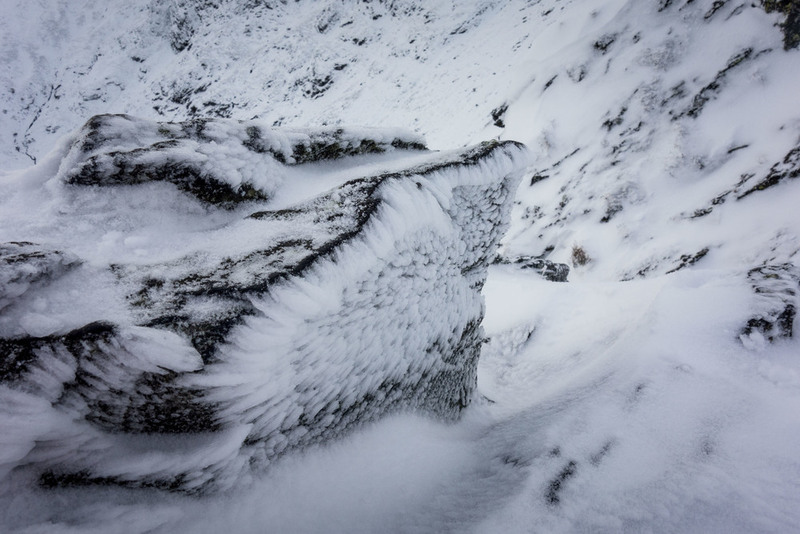 It had a lovely covering of snow and rime ice covering the rocks but no hard ice/neve. Some others joined me on the ridge and passed while I stopped to take photos - there was some very variable but superb spells of light as the clouds drifted in and out and I could make out some other figures on the next shoulder. 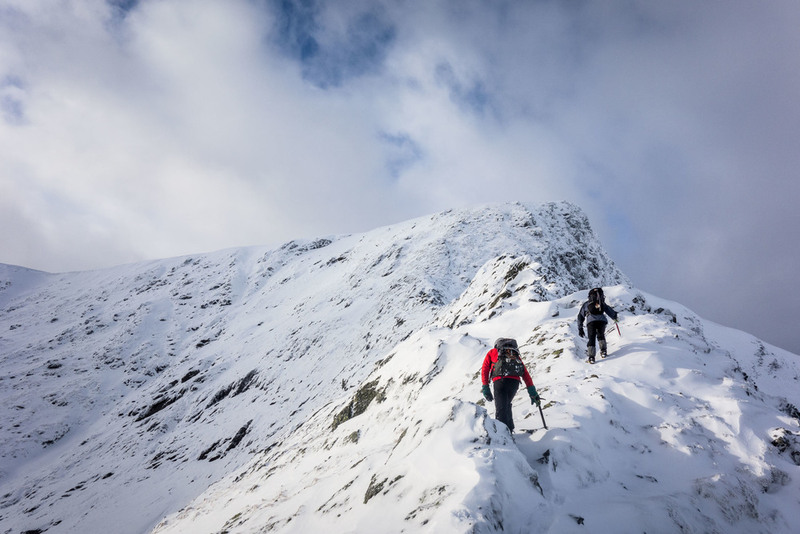 This is my favourite Lake District ridge scramble in summer and it's even better in winter, just a shame it doesn't go on longer! 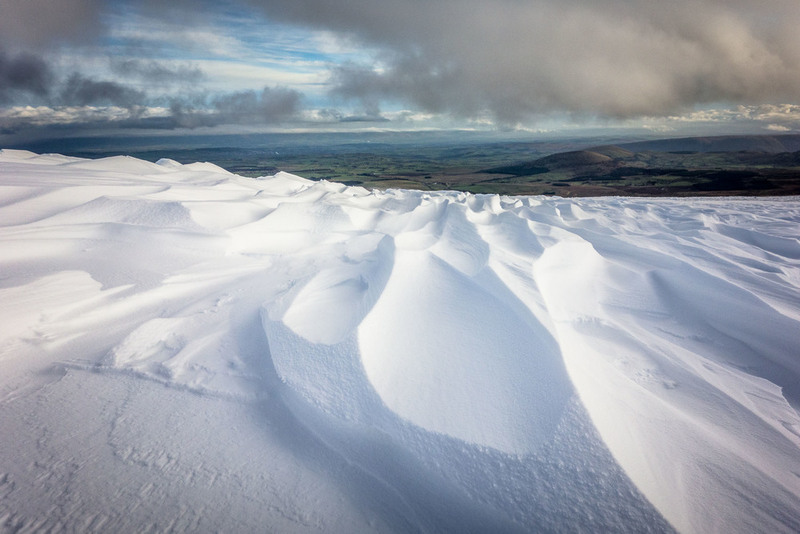 After reaching the summit plateau there were still some great views to be had and some wonderful snow formations. 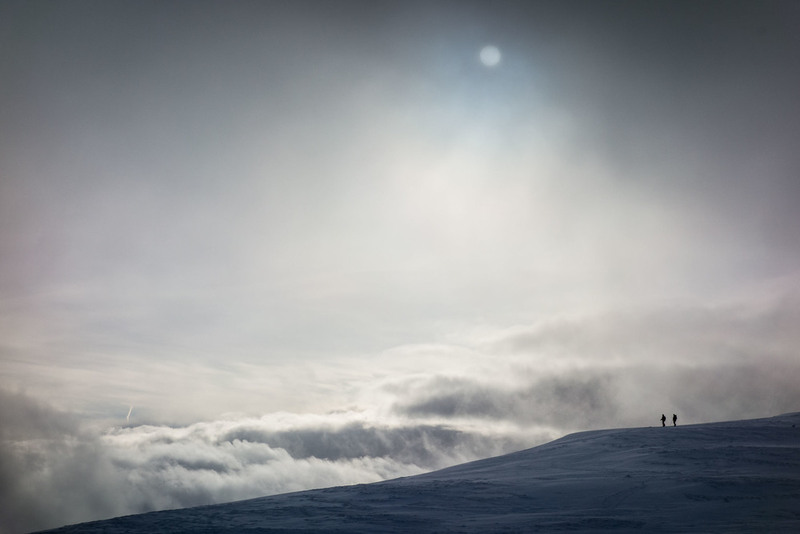 However, once I reached the summit itself, as predicted, the weather closed in and the view disappeared. I stopped to make another brew on the top before heading down - with next to no visibility left I decided against Hall's Fell Ridge and went for the quick/easy option back down to the car. 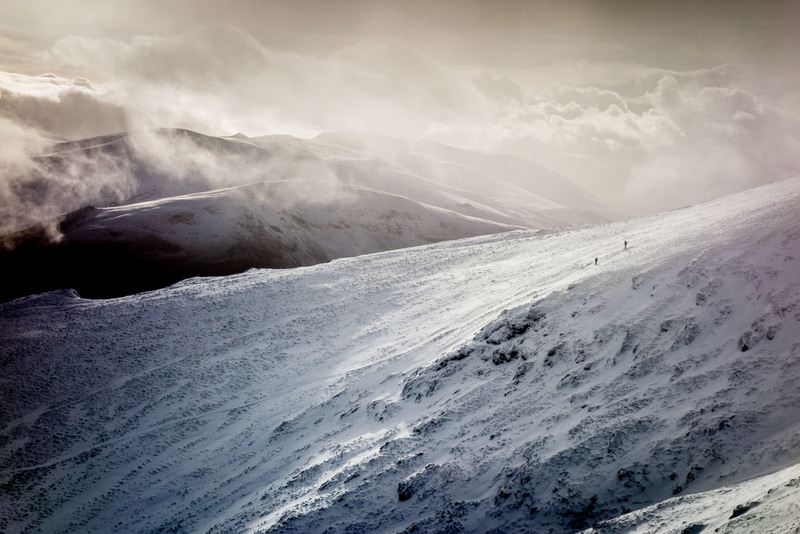 My next scheme (if conditions allow) is to do a similar mission on Helvellyn but this time skiing back down. To come back to the earlier question about the Sony RX100 - I'm still not sure if it's quite a DSLR replacement for the mountains, but it comes very very close. I'm still a fan of the Micro Four Thirds system but the Sony RX100 is tiny and very capable so I find myself using that in preference these days (admittedly I only have the first generation M4/3 GF1 - still a classic!). The dynamic range in the raw files on the RX100 is really impressive and at 20MP you could make decent sized prints that would hold up well to shots from my Canon 5D mk III. There are definitely occasions when things like the better focus speed and ability to use remote flash triggers, filters etc (yes I know you could probably do this with the RX100 but would you really?) mean that a DSLR will come up trumps, but for most occasions the RX100 is plenty good enough. The colours are very good but not quite as good as from a full frame sensor. I'd be interested to try the MK IV but the MK I cost me just over £200 new - it's really incredible for that kind of money.